Our hospital sites are smoke free – read A breath of fresh air - our vision for smoke free hospital sites.pdf [pdf] 1MB. This means that visitors, patients, visitors and staff are not permitted to smoke on Trust grounds. If you need to stay over in one of our hospitals, you will not be allowed to smoke anywhere on the hospital site, including outside areas. If you need support to help reduce the cravings, please speak to a member of staff who can provide you with Nicotine Replacement Therapy. Hopefully you may decide your hospital stay is a great opportunity to stop smoking. If that’s the case, our hospital-based advisors can offer support and give you information about local services - ask staff on your ward for more information. 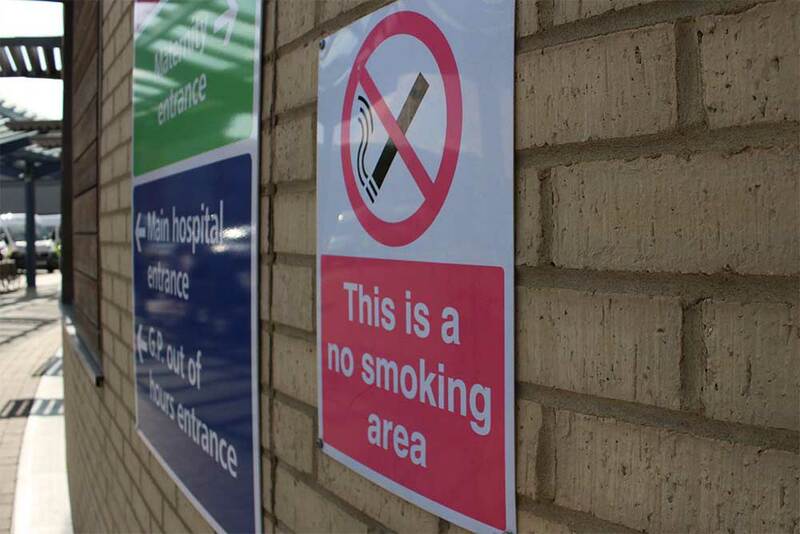 If you are visiting a friend or relative in one of our hospitals, you will not be allowed to smoke anywhere within the hospital building or in the grounds. If you are a patient or carer, please speak to any clinical staff member for support or contact your local stop smoking service. You can also get advice and support from your GP or pharmacist. Carbon monoxide is just one of the thousands of toxic ingredients in cigarette smoke. Although widely known to be responsible for deaths due to faulty gas boilers and car exhaust fumes, fewer people are aware of its presence in tobacco smoke. Even tiny amounts of CO in air can be dangerous. You can read more about the effects of carbon monoxide in our leaflet. Midwife Tracey Owen explains how smoking can harm your baby and even lead to miscarriage and other birth complications. Health visitor Ruth Oshikanlu talks about why you should stay an ex-smoker when you become a parent. Asthma is a chronic condition causing cough, breathlessness and wheezing. An expert explains the causes, symptoms and treatments of asthma in children, and how the condition can affect them. If you smoke, you're more than twice as likely to have a heart attack than someone who doesn't. Lisa shares how she managed to quit for good, and the benefits it's brought her. Chronic obstructive pulmonary disease (COPD) is the name for a collection of lung diseases, including chronic bronchitis, emphysema and chronic obstructive airways disease. People with COPD have trouble breathing in and out, due to long-term damage to the lungs, usually because of smoking. Watch this video to find out more about COPD (bronchitis and emphysema), which affects an estimated 3 million people in the UK. Young people from Lancashire have taken part in a campaign to highlight the importance of standardised packaging in the fight to reduce the number of young people who take up smoking ahead of legislation for standardised packs which comes into effect from 20 May 2016. A short film about the harms of secondhand smoke and the positive impact of smokefree homes. Since 1 October 2015 it has been illegal to smoke in a vehicle with anyone under 18. This short animation tells people about the change in the law in England and Wales.